Potential favorite for the Grade 1 Kentucky Oaks, Midnight Bisou breezed at Santa Anita Park at about 4:30 a.m. on Sunday morning. According to drf.com, the 3-year-old daughter of Midnight Lute covered five furlongs in 1:01.60 under jockey Martin Pedroza. Midnight Bisou was a convincing winner of the Santa Anita Oaks, and is undefeated in 2018. She also finished second by a nose twice as a juvenile, both to Grade 1 winner Dream Tree. 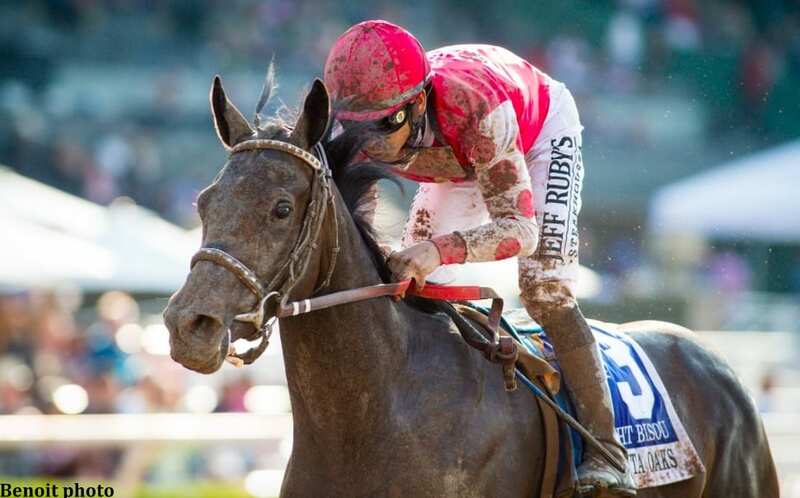 This entry was posted in NL List, Racing and tagged Bill Spawr, dream tree, kentucky oaks, Martin Pedroza, midnight bisou, midnight lute, santa anita, Santa Anita Oaks, santa anita park by Paulick Report Staff. Bookmark the permalink.